Prevent water spots and speed up drying time! One of the hallmarks of a good wax is the ability to make water bead on the surface. Stoner has taken this feature to the max with Bead Max Premium Auto Wax! The sophisticated polymer formula creates a slick, shiny barrier that causes water to bead on contact. As you drive, your vehicle will dry to a spot-free shine because the beads just roll off! Water spots and etching are common problems, but they’re tough to remove. 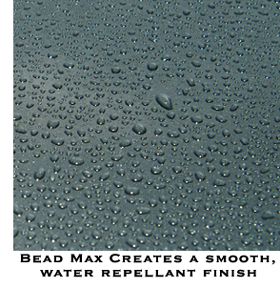 Bead Max prevents cloudy mineral deposits by sealing the paint under a smooth, water-repellant finish. This technology has been available for glass for some time, but Stoner offers you excellent water-repellency for your whole vehicle! Your vehicle will dry faster, appear cleaner, and retain a mirror-like finish! Stoner Bead Max Premium Wax contains a mixture of synthetic polymers, and natural waxes to achieve the best-looking, longest-lasting shine possible. Environmental contaminants that are often found in rain water will slide off your slick paint finish. The chemicals within each polymer lubricate water molecules, causing them to slide off almost instantly! The glossy finish will repel UV rays, too! Bead Max establishes a strong chemical bond through the use of synthetic micropolymers that become even stronger when they are allowed to dry. Simply apply by spraying in a horizontal sweeping motion to any non porous surface. Spread the product over the surface using a microfiber towel or applicator pad. Allow it to dry to a haze and then buff using a clean, microfiber towel. Even glass and chrome can benefit from Bead Max! Bead Max contains no solvents or abrasives. It is perfectly safe on fine paint finishes, clear coats, lacquer, enamel, and acrylic. The aerosol can features AeroGuard technology that ensures consistent application every time- no clogging or sputtering. Protect your vehicle with the best water-repelling auto wax on the market! Stoner Bead Max will give you maximum water beading and a long-lasting, mirror-like shine on all your nonporous, exterior surfaces. Works as described. My friend told me about it so, I thought I'd give it a try. Fast and easy. Works surprisingly well for the money. Goes on easy, buffs off fairly easy and lasts longer than expected. My cousin was a pro detailer and used this on customer's cars. I've used this for about two years now and I love it. It's easy to use and lasts a few months. Good stuff. I actually bought the intro kit from thier site for $50 and everything I've used I really like. Bead Max, Trim Shine, Tarminator, and the Tire Shine. I liked the Tire Shine so much I bought a case of it. It's cheap as well, relatively speaking.